2019 Academy Award winner for Best Picture, Green Book is coming to Digital February 19, 2019 and 4K Ultra HD, Blu-ray™, DVD and On Demand March 12, 2019 from Universal Pictures Home Entertainment. Inspired by a true friendship that transcended race, class, and the 1962 Mason-Dixon line, the Peter Farrelly-directed film tells the incredibly moving story of two men (2019 Academy Award nominee for Best Actor Viggo Mortensen and 2019 Academy Award winner for Best Supporting Actor Mahershala Ali) from different worlds who form an unexpected friendship. Read our review of the Oscar-winning film here. When Tony Lip (Mortensen), a bouncer from an Italian-American neighborhood in the Bronx, is hired to drive Dr. Don Shirley (Ali), a world-class Black pianist, on a concert tour from Manhattan to the Deep South, they must rely on The Green Book to guide them to the few establishments that were then safe for African-Americans. Confronted with racism, danger as well as unexpected humanity and humor—they are forced to set aside differences to survive and thrive on the journey of a lifetime. Filled with acclaimed performances, the film also stars Linda Cardellini. Virtuoso Performances – Go behind the scenes with Viggo Mortensen and Mahershala Ali as they discuss their characters and the lengths they went to accurately portray them. An Unforgettable Friendship – Cast and filmmakers discuss the friendship between Don Shirley and Tony Lip. 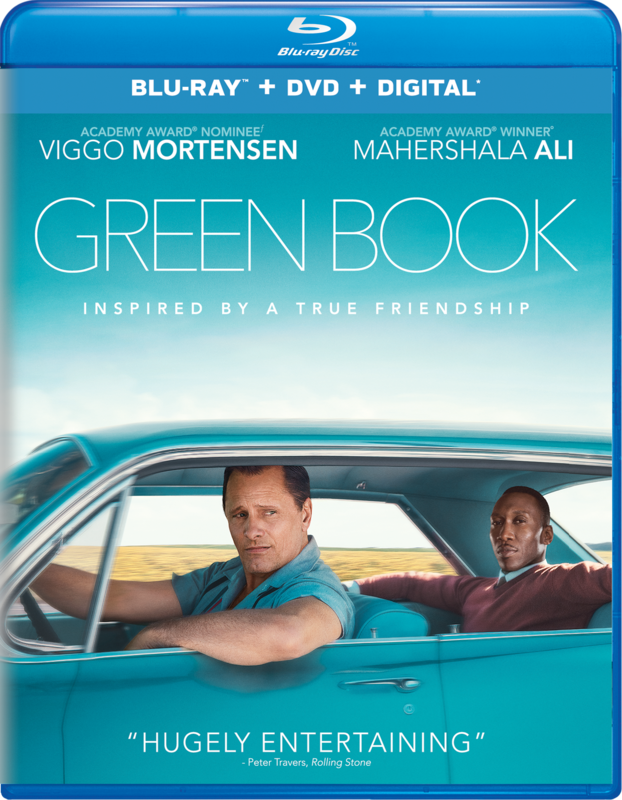 Going Beyond the Green Book – Filmmakers and cast discuss the significance of The Green Book. With a running time of 2 hours 10 minutes, Green Book is rated PG-13 for thematic content, language including racial epithets, smoking, some violence and suggestive material. Enter to win a digital copy of the movie!! COMMENT BELOW with the name of your favorite BEST PICTURE OSCAR WINNER. One entry per person. One digital movie winner will be chosen at random. Good luck! UPDATE: This giveaway has now ended and a winner has been notified. Thank you to all who entered! Bookmark our giveaway page for more exclusive movie reviews, screenings, and giveaways! BEST PICTURE OSCAR WINNER = One Flew Over the Cuckoo’s Nest ! Rocky! One of my all time faves. Also the last movie I watched with my grandfather before he passed, a great underdog story for everyone!